Super Hero Boy: We're a huge fan of classic toys! We're a huge fan of classic toys! With all the hype about all these new modern toys with remotes, that take a ton of batteries, and of course cost a fortune, we seem to have lost the pure joy of some of the classic toys that have entertained children for generations. Babalu Inc. Toys wants to bring some of that magic back into your home! Felt Tales are these super cute lap sized felt boards that bring that magic of felt board story telling right into your living room. Each set comes with more pieces than really comfortably fit on the board so your possibilities are really endless. Actually whats really impressive about the little felt creations is just how much detail is included on each board and each little cutout. We received the Dinosaur Days kit and from the little shell on the turtle to the flowers on the trees everything is in super cute detail and there are over 20 pieces in this set! Once your done playing there is a little storage pouch attached to the back of the felt board that will hold all your felt friends for the next session. Personally I'm in love with the Trex and I could come up with a ton of stories involving him "rawering" the other dinosaurs as Connor would put it. Along with really cool felt boards under their WJ Fantasy line of toys you can find something we've always wanted to try but never had the chance. Actually my friend Stacy once told me if I was to buy Connor any toy in the world it should be a set of nesting blocks. I honestly always thought nesting blocks were sort of um, boring, but that was before I saw the gorgeous and really diverse options you can find through this line! We received a set of the My Busy Day - Touch and Feel Building blocks and they not only rival any touch and feel book we currently have but they really keep little one's attention as there is something new to see and feel on each side of the blocks. Connor spent a good hour checking out each side of the blocks the first time we had them out! You can check out the entire line of Balabu and WJ Fantasy line of toys on their website. As well as purchase them in their online web store! If your looking for a really unique cool Christmas gift you can't go wrong! 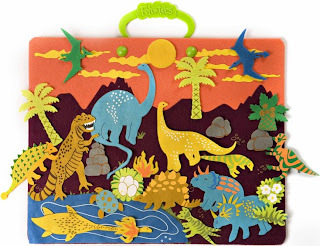 I'm giving away our Felt Tales Dinosaur Days to one lucky winner! Leave a comment on this post. Just check out the Balabu website and tell us which toy from their collection other than the Dinosaur Days or Touch and Feel blocks we mentioned here is your favorite! I'd love their Busy Day on the Farm set! we would love the FeltTales - Heroes to the Rescue!! Oh my gosh, what a great site, I love their tea party set and the capitain Peg Leg box! I like the FeltTales - Heroes to the Rescue!! My kiddos would really like the Busy Day on the Farm set. I like the Old MacDonald's Farm from their WJ Fantasy line. I would like the Sports Puzzle. Love the FeltTales Princess at the Grand Ball! I like the Fairy Tale one. Thanks for the chance. I like their Felt Tales Riding School - very cute! I like the Dollhouse Building Blocks-so neat! Busy Day On the Farm set. I love the Busy Day on the Farm set. I like the FeltTales - Riding School! I like the Heros to the rescue one. The Felt Tales Heroes to the Rescue set is my favorite. I like the felt tales heroes, the dinosaur one is my top choice. I also like the 31 Day Halloween Countdown. What a fun advent calendar!